"Two crunchy oatmeal layers with a gooey date filling in between." 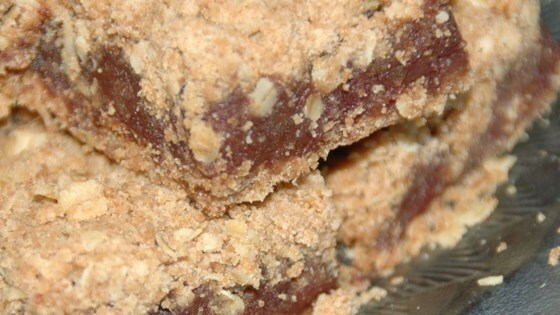 To make filling: In a small saucepan, combine dates, brown sugar, and water. Bring to a boil and cook, stirring constantly for 10 minutes. Remove from heat. To make the crust: Combine flour, oats, brown sugar, baking powder, and salt in large bowl. Cut in shortening until mixture becomes crumbly. Press half of crust evenly into baking pan. Spread date mixture over the top. Crumble remaining crust mixture over the top of date mixture. Bake 20 to 25 minutes. Let cool on wire racks before cutting into bars. This bar was soooo dry that when you cut it all that came out of the pan was the date filling. All of the oatmeal mixture just fell away. Terrific!! My "I hate dates family" went nuts. Currently baking 2nd batch in 1 wk. Full recipe use a 9x13. Half recipe 8x8.